MG-SOFT MIB Browser Professional Edition with MIB Compiler is an extremely flexible, technically superb, powerful and user-friendly SNMP Browser. All that makes MG-SOFT MIB Browser the most widely used SNMP Browser running on Windows operating systems. Besides, Linux, Mac OS X and Solaris versions of the software are also available. MIB Browser allows you to perform SNMP Get, SNMP GetNext, SNMP GetBulk and SNMP Set operations. Besides, the software lets you capture the SNMP Trap and SNMP Inform packets that were sent from arbitrary SNMP devices or applications on the network. 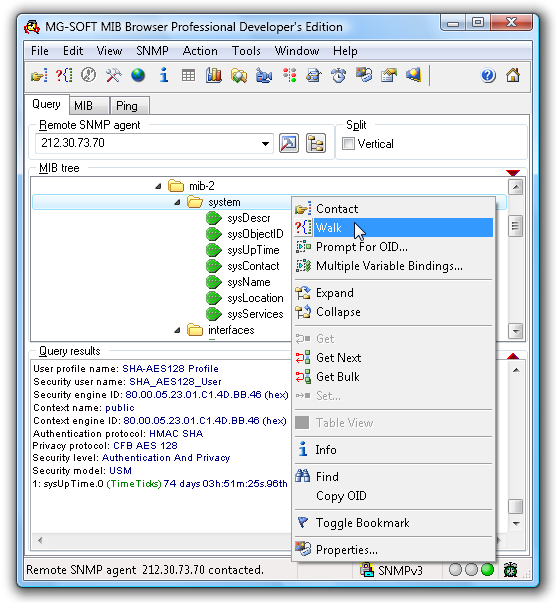 MIB Browser can monitor several SNMP devices simultaneously and includes features like SNMP Table viewer, SNMP Table 'editor', logging capabilities, real-time graphical presentation of queried numerical values, scan for implemented MIBs in agents, comparison of SNMP agent snapshots, management of SNMPv3 USM users on remote SNMP agents, etc.